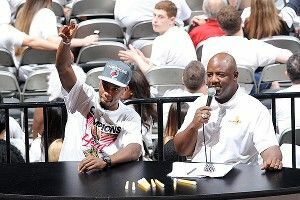 Last Thursday, the Miami Heat won the NBA championship, beating the Oklahoma City Thunder in five games. This triggered a series of celebrations among the Heat players, Heat fans, and people who want to be on the Internet. These are the videos of those celebrations. IS THIS A ROAST? I’m dead. I have no more breaths to breathe. LEBRON WOULDN’T LET THIS DUDE LOVE LIFE FOR ONE DAY. MVP. I think it’s about time we start celebrating Juwan Howard’s elder-statesman role in the NBA, instead of teasing him for being such an Old Man River. Yes, at times, it’s hard to defend Juwan when he steps on the court and doesn’t do much, but when it comes to his off-the-court presence, coupled with his age, he’s truly a beautiful creature. What took place at the Miami Heat championship celebration on Monday illustrates this point perfectly. I’m just upset that Juwan didn’t break out the rest of the dance moves I know he has in his “I was Norris Cole’s age in the early ’90s” arsenal. You know, like the ones his occasional doppelganger taught us. Someone keep a camera on this man. When Juwan is expressing himself through the art of dance, we need to be there, cheering him on. You know what? Why don’t you just let this guy with the towel on his head arrive at the parade when he wants and determine for himself whether he is early or not? I personally guarantee you these dudes were listening to something more like Gunplay or Big K.R.I.T. or whatever. The only Vengaboys-type jams you’re going to hear in the Heat locker room are on Dexter Pittman’s iPod. + 1 snark points for whoever did this. I like this music cue because it reminds me of the Ewok celebration at the end of Return of the Jedi. I say that without actually checking on the music that scores the Ewok celebration. Also, spoiler alert: Ewoks celebrate at the end of Return of the Jedi.